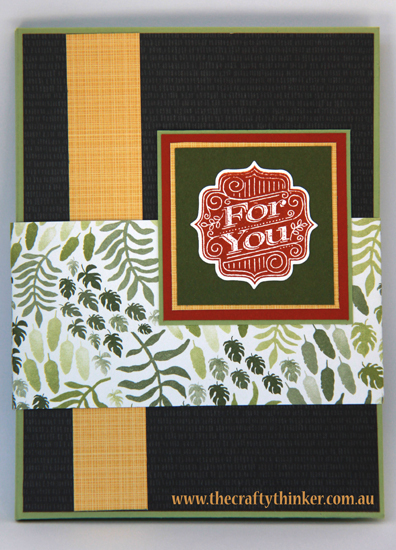 From time to time I like to make a set of cards to present as a gift. 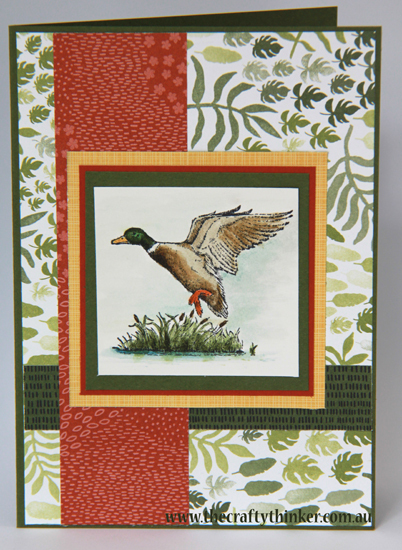 I decided, this week, to make a masculine set of cards as a gift for a friend, that she can use for any occasion.. The main elements of the set are The Wilderness Awaits stamp set and Botanical Gardens DSP. 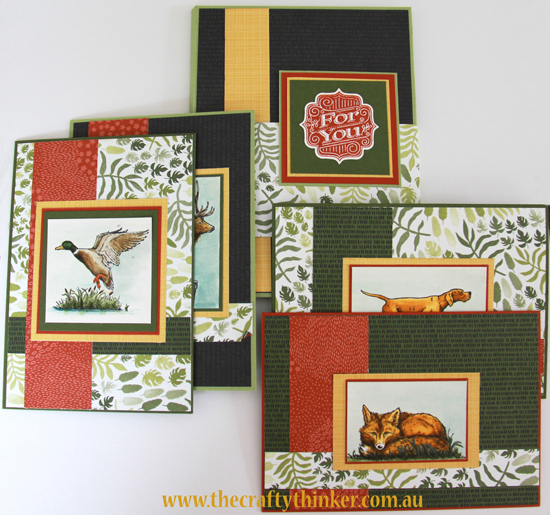 I stamped each of the animals onto Shimmery White cardstock with Basic Black ink and then watercoloured them. 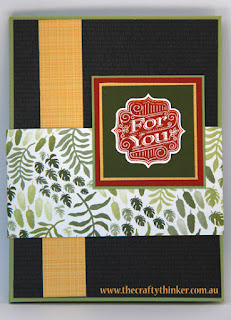 The inks I used were: Mossy Meadow, Pear Pizzazz, Sahara Sand, Crumb Cake, Soft Suede, Delightful Dijon, Soft Suede, Cajun Craze, Garden Green, Soft Sky, Smoky Slate and Basic Gray. 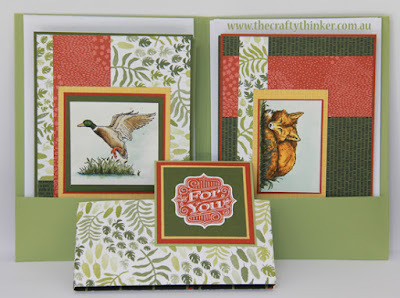 I then layered the images onto the cards using a variety of patterns from the Botanical Gardens DSP pack and Mossy Meadow, Cajun Craze and Pear Pizzazz cardstock. 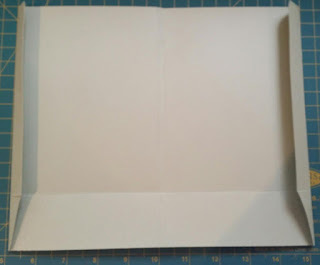 I used an A4 sheet of Pear Pizzazz cardstock to create a wallet to hold the cards and envelopes and I'll include instructions at the end of this blog. 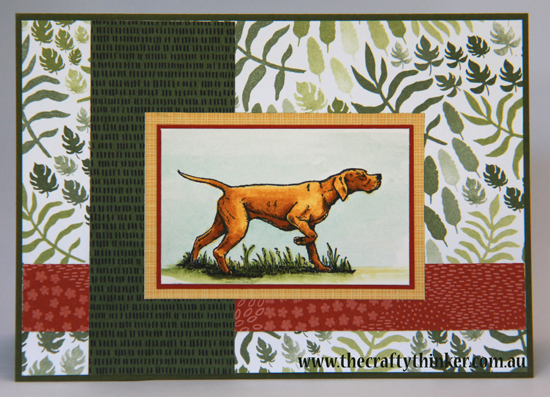 The dog is coloured with Delightful Dijon and Soft Suede inks. When colouring the images, I started with the sky. I "painted" around the animal with a clean, wet brush, then painted with Soft Sky ink. 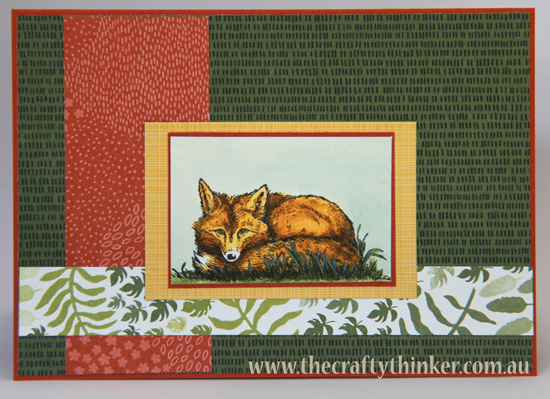 The fox is also coloured with Delightful Dijon and Soft Suede inks. I left his nose & tip of his tail unpainted. I dried the sky before painting the animal. I googled some duck photographs before I started colouring this one! The last area I coloured was the ground .... or water! 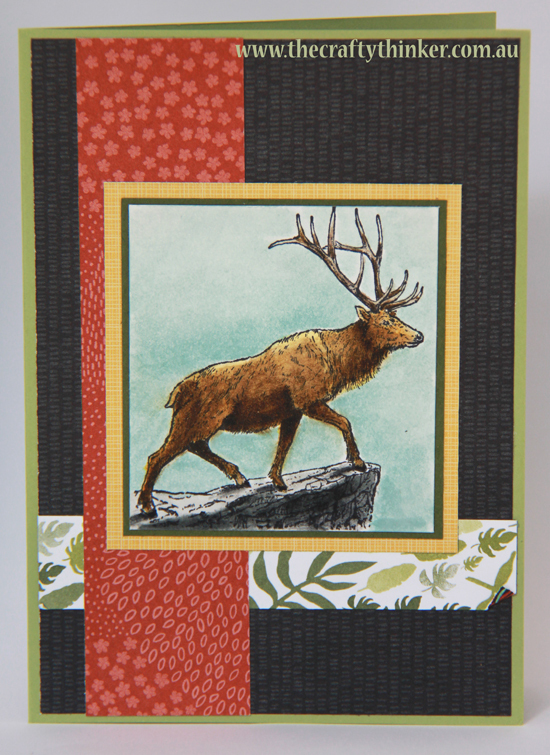 The stag is mostly coloured with Soft Suede. The antlers are crumb cake and Soft Suede. I don't get full marks for the colouring on this one! More about the wallet for the card set. 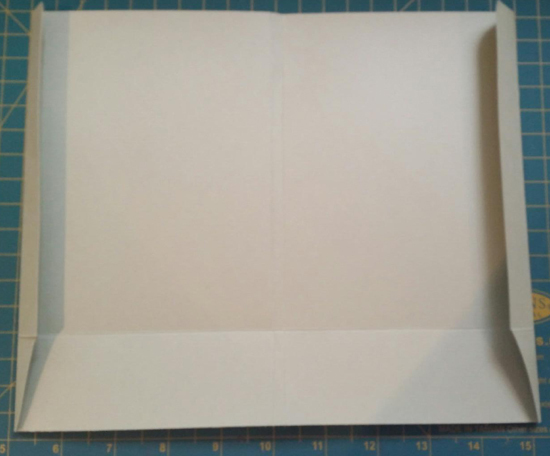 My four cards are A5 folded in half and there are four C6 size envelopes. I made my wallet to fit. I used an A4 sheet of card and, with the short side at the top of the scoreboard, I scored at 1 3/4". 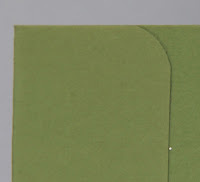 I then rotated the card and scored along the long side at 1 3/4", 5 5/8", 5 7/8" and 10 3/4"
With the horizontal score line towards the bottom, I used a round corner punch on the top two corners. 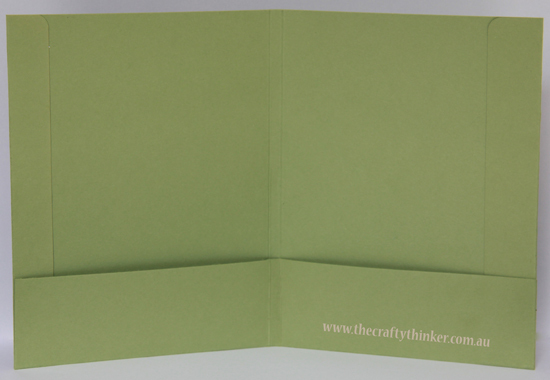 I folded in the two sides and, with a pair of snips, cut from the score line to the corner to trim away some of the excess card. I used Fast Fuse to stick down these side pieces. 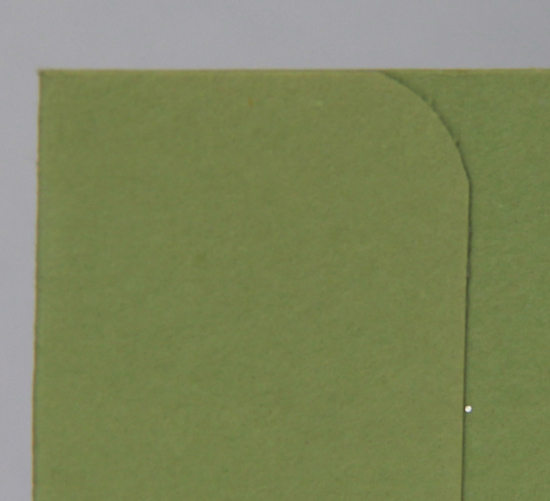 I then folded up the bottom section and, with a very thin line of glue, adhered it at the sides. The belly band is 12" x 2 1/2"
To decorate the front of the wallet, I cut a piece of DSP to 4 3/4" x 6 3/8" and added a strip of contrasting strip of DSP cut to 1" x 6 3/8"
I'm sorry for the poor quality photo, taken on the run! I think the round cornering looks a bit neater. To purchase supplies, click on any of the product images below.